GREATEST PITCHING MATCHUP OF ALL TIME? Tonight! Roy Halladay (Yay!) versus Tim Lincecum (Boo!) 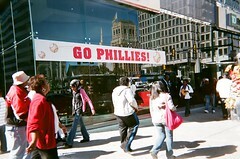 as the Phillies square off against the San Francisco Giants in the first game of the National League Championship Series.